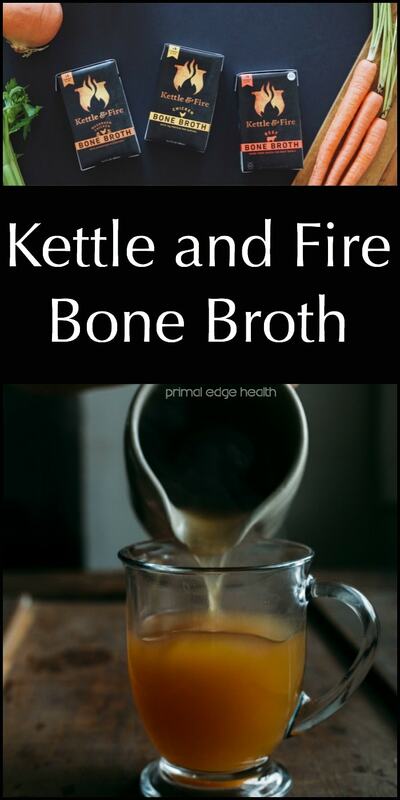 Kettle and Fire Organic Bone Broth! Bone broth is a staple we use as a base for soups, stews, and purees. It is also quite handy to use to simmer vegetables, thin sauces, and in a pan to reheat meats. Of course, you can drink a warm cup of it just like tea or coffee as well! In our small Ecuadorian village, a cow is butchered on Thursday and Sunday. The animal is prepared and presented in the outdoor, open-air market. Meaty bones, called carne con hueso, reside on the counter next to chuck roasts, ribs, and organ meats. In our area, most of the beef is raised in small, family owned pasture land. You see cows dotting the mountain slopes as you dive through the valleys. 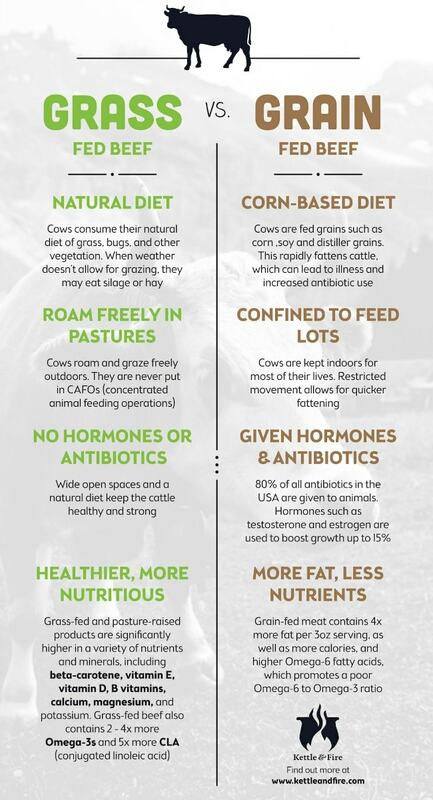 Cows mature on grasses and whatever other edible plants are mixed in with the landscape; their life is simple and their meat delicious! The local culture here is utilitarian with their animals. There is a value in all parts of the animal and not much goes to waste. “Nose-to-tail eating” is not as foreign as a concept as it has become in places like the United States. Before moving to Ecuador, I had never been directly exposed to high-quality bone broth let alone the bones themselves. By now, I am well accustomed with meaty bones and marrow bones, the essential ingredients for our weekly broth, which are easily found in any meat market. Incorporating broth into my regular diet was one of the first steps I took many years ago to maximize nutrient density. I’m talking about REAL broth, not the thinned down, MSG laced, watery stock stabilized and preserved with chemical additives that you get from a store. True bone broth is a nourishing elixir, my enjoyment of this traditional food was such a profound discovery that I began making my own brand and selling it locally for a while. My product was based on our Never Ending Pot of Bone Broth. Making broth and handling bones isn’t a task for everyone and that is why I appreciate the good work going on over in the Kettle and Fire kitchens. 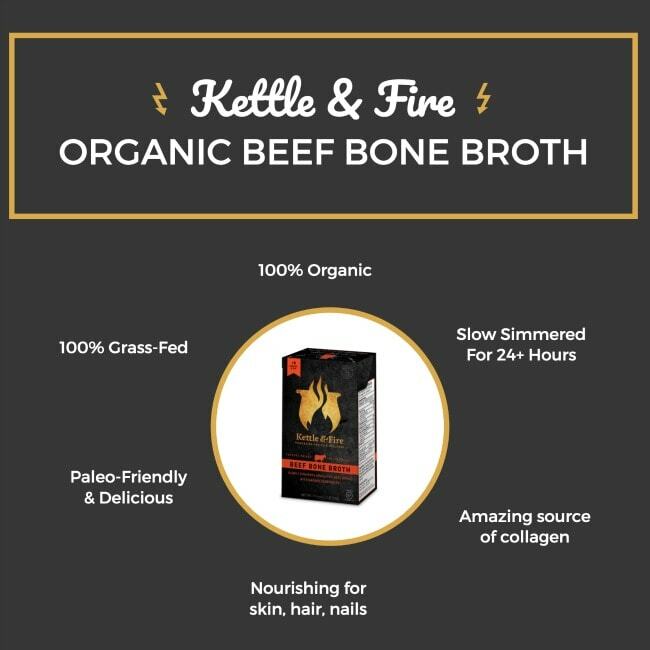 Kettle and Fire is a high-quality, bone broth company that makes beef and chicken broth from 100% organic ingredients with NO chemical add-ins, preservatives, or flavoring agents. Our endorsement of their product rests on their integrity, quality standards, and honest appreciation for this heritage food. 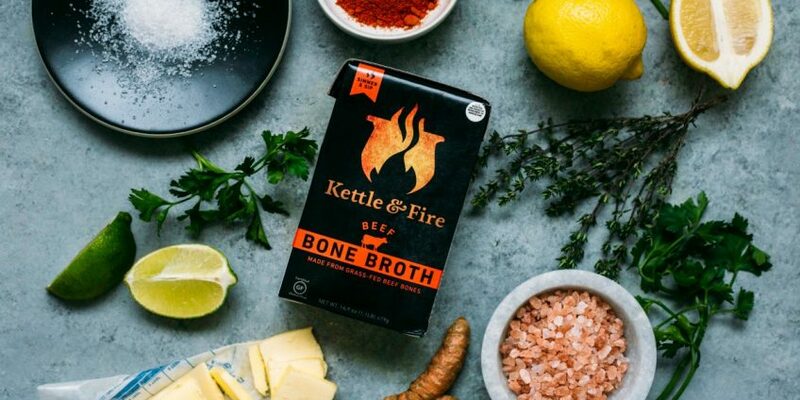 Kettle and Fire has a budding online presence that extends the availability of bone broth to many who lack local resources, time, or interest in making it themselves. With an order from Kettle and Fire, you know the product you receive will be just as good as one you make on your own stove top. The Kettle and Fire Blog is full of interesting “odd bits” (hahaha..) of information. From an historical overview to the run down on collagen, gelatin, and gut health, these articles are ones I would actually read. Buy their broth and search through the slew of recipes they provide for keto and paleo style diets. There are a number of recipes our Ketogenic Edge Cookbook as well! Stick around us long enough and you will have no lack of inspiration for what to do with your delicious broth! Be sure to tag us (@primaledgehealth or #primaledgehealth) on Instagram and Facebook to share your photos with us and others interested in top quality, nutrient dense, low-carb food! Our intention with the training manual that is The Ketogenic Edge Cookbook is to teach you all how to efficiently and effectively prepare wholesome, nutrient dense, low-carb foods in your own kitchen. In the beginning text we discuss the importance of souring organic ingredients and humanely raised livestock, free from antibiotics and synthetic hormones. We emphasize the importance of cooking from scratch but know realistically, it isn’t always possible. Here is where Kettle and Fire can help you out in your food prep! Save hours of simmering bones, without sacrificing flavor or nutrient quality. The Kettle and Fire packaging is minimal, environmentally friendly and biodegradable. They offer free shipping on bulk orders of 6 cartons or more. They also offer subscription services (with a discounted price) for broth lovers that want a steady flow of this golden liquid. There are a few other ways to score discounts on Kettle and Fire broths. They offer a $10 credit when you refer friends as well as a first time purchase discount. If you have any questions, try out their live chat – the customer service is awesome! Kettle and Fire bone broth is a hassle-free, nutrient dense product that rises to our high-standards of quality and taste. As you support their company buy purchasing their broth you are voting for quality and integrity with your dollar. Vote for companies that care about their product, their customers, and their environment. If you are interested, please use our links from this article and Kettle and Fire will thank us for spreading the word about healthy, nutrient dense foods with a small commission. I love bone broth and use it in just about everything. I even used it to make my son’s purees when he was a baby. When any recipe requires stock- I always use bone broth. 1) for the extra flavor and 2) for the extra health benefits. Bone broth has helped heal my leaky gut syndrome and my inflammatory bowel disease that I used to suffer from. It’s warm, comforting and healing. Couldn’t live without it now! I am looking forward to trying this bone broth. I drink bone broth almost everyday. Everything you sell or suggest has turned out great, so I am sure this will be as well. Thank you! I just received my first delivery of the chicken bone broth and absolutely love it. I add some black and white pepper some Turmeric some cayenne pepper throw in my MCT oil and Hemp seed oil a little apple cider vinegar and a little lemon juice and I now have my new favorite morning drink. It’s delicious and uber healthy. I’m going to try your recipe too, it sounds delicious! I’ve never tried bone broth and am just starting on my Keto journey. I have struggled with my ideal weight since leaving the Military and am looking forward to all the benefits to be enjoyed from this lifestyle change. I would love to try this broth. Thanks for the encouraging and informative Youtube channel you provide. The cookbook is a great resource as well especially for a someone like me who had no clue where to even start. Thanks again Haggard family! Sounds like a great product. I’d love to try it! I am just know trying to educate myself in the ways of bone broth. I have been doing keto for a few months now and have seen it pop up in sooooo many discussions. It sounds like a wonderful way to get some added nutrients in my life! I will say I did experiment with some store bought crap and was not impressed, I wanted to make some on my own but who has the time or space?! I know how much you guys value products that you can stand by so I am definitely going to check these guys out. Thanks for the info! 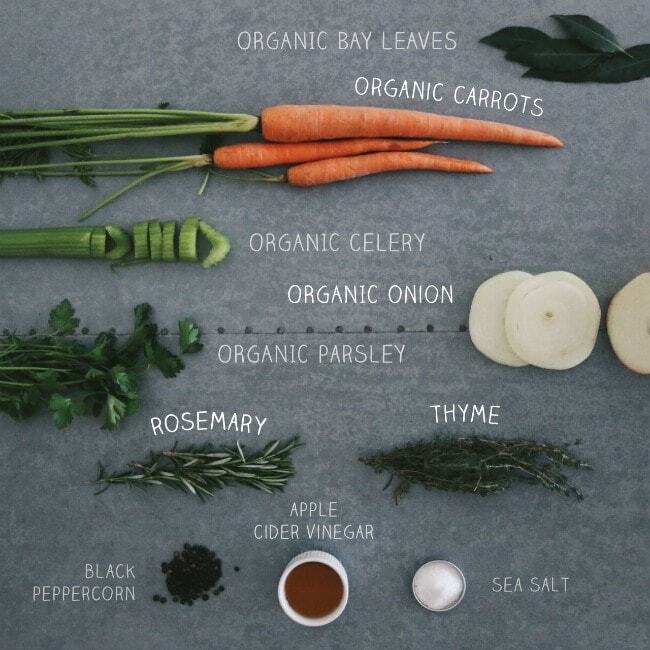 Bone broth & rosemary w/ cracked pepper & roasted garlic is the bomb – so good for your! I love starting my work day with a delicious warm mug of broth during Winter. I currently use dehydrated broth powder which is quick and easy but is terribly expensive so I’m on the hunt for other options. Would love to try this bone broth! Been doing keto for almost 4 months and would love to add this in. You guys are awesome. Love your videos and your cookbook is amazing! My nutrition. I’m trying to undo some metabolic damage from over working out and under eating and some gut healing ! Bone broth is essential to a Ketogenics lifestyle and I am so eager to learn new ways to use it! Quite a coincidence that I found out about this great article today, as I am planning to make a batch of bone broth tomorrow! I am planning on using it to repair my gut and recover from food sensitivities. Very intrigued by the Kettle & Fire Bone Broth and hope to try some soon! I LOVE LLOVE LLLOVE Bone Broth, make it all the time however at the moment I’m out and would love to try yours. I so enjoy your videos and use them for inspiration all the time. I’ve been paleo for a couple of years and keto for the last two months and will definitely have my eye on the ketogenic edge cookbook, (made the little flat breads last week, I live in the deep south in the US, so its a “hoe cake” around here, :)) So glad to found you guys!! !.keep on with your beautiful selves!!!! Yes, yes, yes!!!! Please, please!!!! Your family is what introduced my family ti bone broth! After watching your videeo roast the bones my outlook changed! The flavor is fantastic! We have bounced back and forth between a stove top kettle, pressure cooker and crock pot, all of which seem to have their benefits. Stove top kettle is our favorite method since you can make much larger batches. In a pinch the pressure cooker is great but I have heard mixed reviews regarding the impact on the stability of nutrients while pressure cooking. I would love to hear your perspective on this subject! Regardless, I would like to thank you for all that your passion at Primal Edge Health provides the world, you are making a difference out there for sure! As for bone broth, drink up everyone, if you haven’t tried it yet your missing out! I have wanted to develop a bone broth habit as the best dish i eat is a chicken noodle soup my wife makes all day, passed down from an italian recipe from her grandmother off the boat! I nearly broke my ankle a year ago April and I wound up eating a lot of soup and ate a bunch of gelatin and was back to walking within two weeks…running in a month – from a level three ankle sprain they thought was broken! So I know the value of medicine that is food and this sounds like some amazing food! Well for starters, bone broth along with my keto lifestyle has helped me with a digestion issue I’ve had for years called “GIRD” this disease would cause me to have severe heartburn for hours on end, super painful intestinal cramps that would feel like knives cutting inside me and would also create super uneasy & restless sleep night after night. All this was a daily occurrence in my life and something had to give. Well, since changing my lifestyle and the way I eat especially with the bone broth and keto, all those things that came with having gastrointestinal reflux disease that were part of my everyday and affecting me daily and holding me in a place of bad health no longer hold me back. I haven’t had a flare up or any discomfort since transitioning my lifestyle. This lifestyle change has honestly changed my life unlike anything I could ever imagine. I started out weighing 258 lbs. with chronic pain from the disease and now weigh 211 lbs. and am pain free. This way of living and eating has changed the way I think about food entirely and what I know entirely, I’ll never set foot back into what I once was. The road ahead looks beautiful and I feel truly blessed to have found what I have now than later. Now for how I prepare my bone broth, I mostly enjoy bone broth with maca from Primal Edge Health, turmeric, cilantro and fresh parsley early morning. When intermittent fasting it’s shown to keep me full all day long and keeps me mentally sharp and feeling light and ready to take on whatever the day might bring. My buddy Hunter Thompson told me early about Tristan & Jessicas youtube channel https://www.youtube.com/channel/UC03j2jcKwm0wTJpDsu-9u4g and since then I’ve followed every video and have received so much knowledge that will keep me ready for anything on my journey ahead. My wife DeeAnna Batchelder has also taken on all the amazing perks of eating bone brother and living this keto way. Thanks for all the love and support baby! I want to shout out my brother Phil Davis for sticking to his Paleo lifestyle too, keep at it! Sorry for the long drawn out message here but I truly appreciate all the time you take and everything you guys do for you viewers Primal Edge Health. Stay blessed family!